THE SWAN maybe one of the most beautiful films I’ve seen in 2018. The images are truly stunning. Mixed with an ethereal score it has the power to lift you out of your seat and transport you to the most beautiful places in Iceland. It is the sort of thing that makes the film a must see on a big screen. On the other hand the story, about a young girl sent to stay with her aunt and uncle on their farm far from the coast is murky. Nine year old Sol has been caught shoplifting and was sent to her aunt and uncle's farm to perform penance. There she runs straight into the hard life of the farm. Kept at a distance by those around her (and filmmakers who go out of their way to accentuate the isolation) Sol has to fend for herself. We also get a glimpse of the adult world that she doesn’t fully comprehend, or even notice. 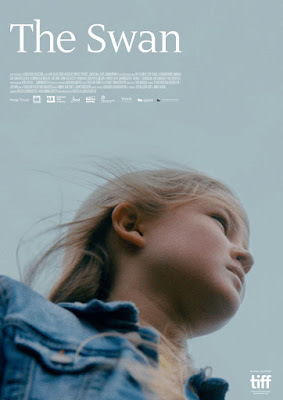 While I admire the fact that director Ása Helga Hjörleifsdóttir’s doesn’t give us all the answers, Sol doesn’t know or doesn't understand life fully so we don’t either, I am not so keen on how it keeps us distant from everyone including Sol. We should be connecting to her but in a lot of ways she remains a cypher. I never was emotionally invested. And while I was not really emotionally invested I was kind of creeped out by her relationship with the farmhand because it is not kosher and darkened everything. While I like THE SWAN, I don’t love it. It has the feel of a film that is trying way too hard to be deep and meaningful thanks to an artifice that gets in the way of a good story. Worth a look for the cinematography but it’s going to end up a film you'll like more than love.